If this card is Normal or Special Summoned: You can Special Summon 1 “Mayakashi” monster from your Deck, except “Hajun, the Winged Mayakashi”. You can only use this effect of “Hajun, the Winged Mayakashi” once per turn. You cannot Special Summon monsters from the Extra Deck, except “Mayakashi” monsters. Hajun, the Winged Mayakashi helps make the Mayakashi deck go by getting you to your best monster: Dakki. Level 1 and searchable, Hajun can Special Summon a Mayakashi from the deck when he is Normal or Special Summoned. This card should be named “Dakki’s Helper”. Normal or Special Summon him, get Dakki, and you have what you need for your first Synchro Summon. Run three of this guy to max out on your first turn chances. One for One helps and it being a Zombie gives it synergy with Pyramid Turtle and Goblin Zombie. Locks you into Mayakashi monsters, but so does Dakki and her tricks, so this isn’t a restriction for the archetype. As for others that may be balancing Mayakashi monsters and other Zombie monsters, this will just be a turn where you don’t go other Zombie or other Extra Deck monsters. Pretty simple card to use: Summon, get Dakki, climb that ladder up and down! Of course you could get another monster for board presence and go the non-Synchro route, but why do that when the deck is geared towards that? We looked at the most important card in the archetype yesterday, now we look at the best way to get to that card: Hajun, the Winged Mayakashi. Hajun is a Level 1 WIND Zombie with 600 ATK and 400 DEF. ATK and DEF are never really going to be good on a Level 1, Zombie is a great type, and WIND is about on the same level if not worse than FIRE. If this card is Normal or Special Summoned, you can Special Summon 1 Mayakashi from your deck except another Hajun and this is a hard once per turn. This immediately gets you to Dakki for your Synchro Climbing to begin with the Level 3, or you can get the Level 3 Main Deck monster that can revive Dakki with its own effect, use those two to Link into the Link-2 Mayakashi, and then revive Dakki with her effect and then do the Synchro Climbing with this and Dakki. This helps get the Synchro Summoning going in the deck so much. This card also has a restriction while on the field where you cannot Special Summon monsters from the Extra Deck, except Mayakashi monsters, cause they really want you to use the archetype to summon their archetypal cards only. Still, Hajun gets things going and you can easily revive this with Mezuki or Monster Reborn or summon this from the deck with One-for-One. Hajun is the best non-Tuner monster in the Main Deck and another three of probably. Art: 4/5 Yeah, I guess he’s a Winged guy. I don’t like when the attributes inside a theme differ, it can make things rather difficult at times. 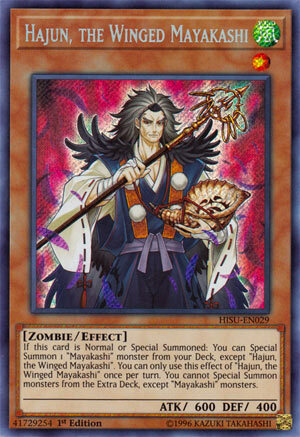 Having said that, Hajan, the Winged Mayakashi is our Zombie of the day. This is Level 1 and Wind, with 600 attack and 400 defense. This is a much more combo oriented card than yesterday, but it also has some legs with its search ability, which is nice in a card. When Normal or Special Summoned, you’re able to Special Summon a Mayakashi Monster from the Dec, other than Hajun, of course, as we see all too often in any theme. Said effect, appropriately is just once per turn, and like we saw yesterday, you’re prevented from Special Summoning outside of the theme, but that still no problem whatsoever. Bringing out Dakki from yesterday would give you the benefit of a Tuner (and you have 3 Levels on the Field at this point too…the 1 here and 2 from yesterday) and probably more. They obviously play very well off each other. They do different things, but that’s good inside and for of a theme too folks. Yesterday I said you’d probably only need two of, here I see no reason not to play three in Hajun. Art: 4/5 This picture is good, too, and there are wings I guess, but this guy looks more like a Gravekeeper than anything (and neither of them really looked like Zombies).